After 30 hours flight from Shanghai over Toronto to Santiago de Chile, I arrived at my friend’s place already disappointed about not being able to go to the Easter Islands. This little 163.6 km² piece of volcanic material is the most remote inhabited island on this world. The island and its history was also made world-known in a major movie by Kevin Costner: Rapa Nui. And I was so near and could not get to it. In the beginning of my travel planning I was very indecisive of flying to Easter Island or not, I only wanted to visit my friends from China and Germany who independently from each other immigrated to Chile. So I wondered what is so great about that country that two of my friends went through the hassle of leaving their home countries and starting a new life there. As LAN Chile monopolized the connection to Easter Island they could ask whatever price they wanted. And they wanted a lot! Nevertheless I booked one flight for 900,- Euro on a the German LAN Chile website but due to some PayPal error I could not get the ticket confirmed. I wrote and called several times to LAN Chile Germany / Europe to get it fixed, but they were not able to do it and even ignored my further emails. 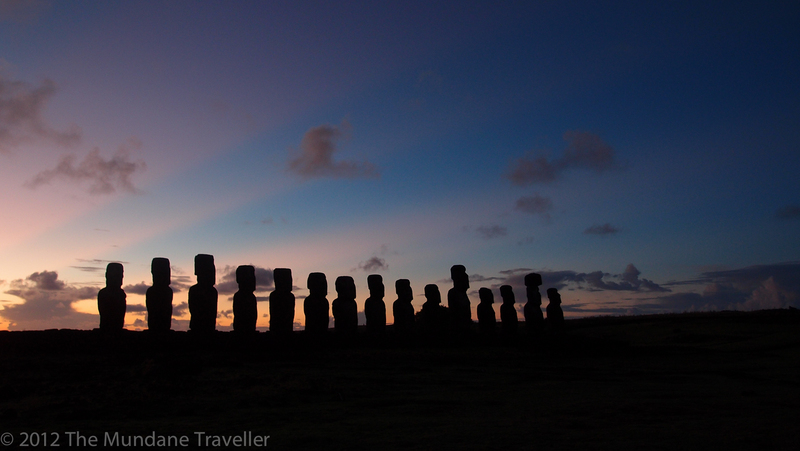 So I was without any ticket to Easter Island when I arrived in Chile. After I settled at my friend’s place we were looking for flights to Patagonia, so I checked the international (english) websites of several travel platforms and LAN Chile. To give it one more try I checked Santiago de Chile to Easter Island again, but the price rose to 1200 Euro already. Well, no Easter Island for me at all, not at that price for just 7 days on the island. During the process of checking the flights from Santiago de Chile down south it hit hard me when I compared the prices I got on my english websites to my friends searches. On the english website of LAN Chile the price down to Patagonia was 2-3 times the price of the spanish LAN Chile website my friend was searching on! Realizing that I tried it also for Easter Island, using the Spanish website. And there it was: a flight to Easter Island at the price of 500,- Euro. I selected a european website so I could pay in Euro with my european credit card believing that in the age of internet all prices are the same for every person on the same website, i.e. there shouldn’t be any price discrimination anymore on the same website. There is still strong price discrimination – by language. When I was on the website in February 2012 it even told me in english (among all the spanish of the local chilean LAN Website): “If you are an international flight booker, please go to the international LAN Chile website”. Ridiculous. Of course I was in Chile at that time, but I could also have been anywhere else, I still would have proceeded with the booking at the lower price. In the end I saved 700,- Euro just by using my spanish skills which I did not do in the beginning due to sheer laziness. It also works in China, I tried it. So instead of www.ctrip.com, please use www.ctrip.cn for better rates for those who can read chinese. In this case the english website does offer the low discounted rates, but only limited flight selections on those. I am sure it works also for websites in every other language and country. If you do not speak spanish or any other language for that sake, don’t worry. Google and many others translate websites into your language of choice with just a mouse-click. The result is not so tremendous like my 700 Euro savings but more than you can explain by exchange rate fluctuations or credit card fees.